Sweet tea vodka comes in many different flavors and sizes (and prices! )- but they all have one thing in common: they’re too sweet. Syrupy sweet- and unless you have the diet of a hummingbird (no judgment here if you do!) they can be pretty hard to stomach- especially if you’re planning on mixing it with premixed lemonade, and they never come in our favorite flavors like green tea, chamomile, or rooibos. The simple solution- make your own! I’m sure you never tried it before because “it takes too long,” and you are right. Leaving a bottle of deliciously clean tasting vodka on the counter for days is just plain torture, but now you can have your own sweet (or not!) tea vodka in any flavor you want in less than 10 minutes! Here’s how: First step- get yourself a vacuum pot. Traditionally used to make fantastic coffee, the brilliance of the vacuum pot is that no steam (or in this case alcohol) can escape, making sure you end up with as much of your fantastic brew as possible. Pour a bottle of Clique Vodka into the bottom chamber and add loose tea to the top. You can use any kind you want- in this case I used my favorite brand of raspberry tea and simply cut the bags open and emptied the tea into the pot. Removing the tea from the bag allows each granule of tea to be completely surrounded by the vodka for maximum exposure, and that’s very important with a vacuum pot since the vodka will only be infusing for a minute or two. Turn the burner on high- and don’t move! They say a watched kettle never boils, but in this case it will- and quickly! As the vodka starts to boil, it will slowly move up the glass tube and settle in the top pot. Wait until only a few millimeters of vodka remain in the bottom, then cut the heat and move the post off the burner. Some of the remaining vodka will move up, but not all- don’t worry about that. After about 20 seconds you’ll see a violent bubbling start on the top and then- Whoosh! All the now infused tea vodka will slowly start to drip back into the bottom pot. Wait until all of the vodka has drained, then remove the top section. Ta-DA! now you have your own tea infused vodka and it only took minutes! 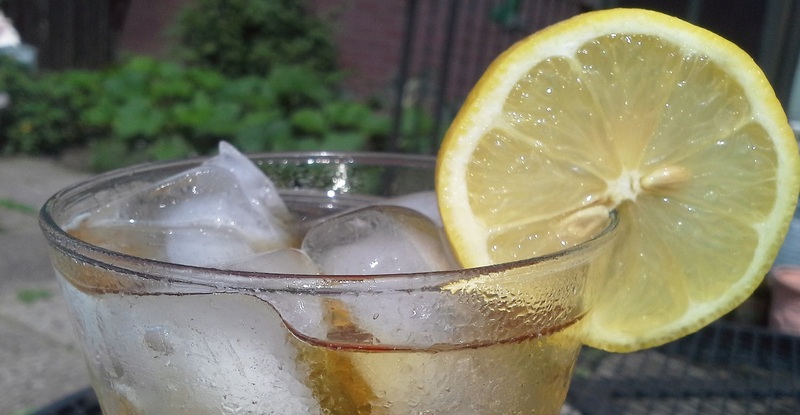 Sweeten it to your liking using simple syrup, honey, agave, or maple syrup and enjoy it on the rocks with a squeeze of lemon, or stick to the tried and true “John Daly” (pictured above) with this recipe: Add 1 1/2 oz tea infused vodka to a tall glass with ice and squeeze in the juice of half a lemon. Add about 1/4 oz simple syrup (more if you like it sweet!) and slowly top with water to keep the drink vibrantly separated while you serve! Garnish with a lemon wheel and bring on the garden party!